Treks to Vermont to expand and stretch my mind are familiar to me. I spent three years at Goddard College in Plainfield from 2007 to 2010. When I cross the state line, my brain automatically opens up a wee bit wider and new stuff pours in! Especially when I spend time with Artist Extraordinaire – Rebecca Schwarz! A few blog posts ago I wrote about her BCA residency and art exhibit. She’s kind of a big deal, I said, and I was soooo right! 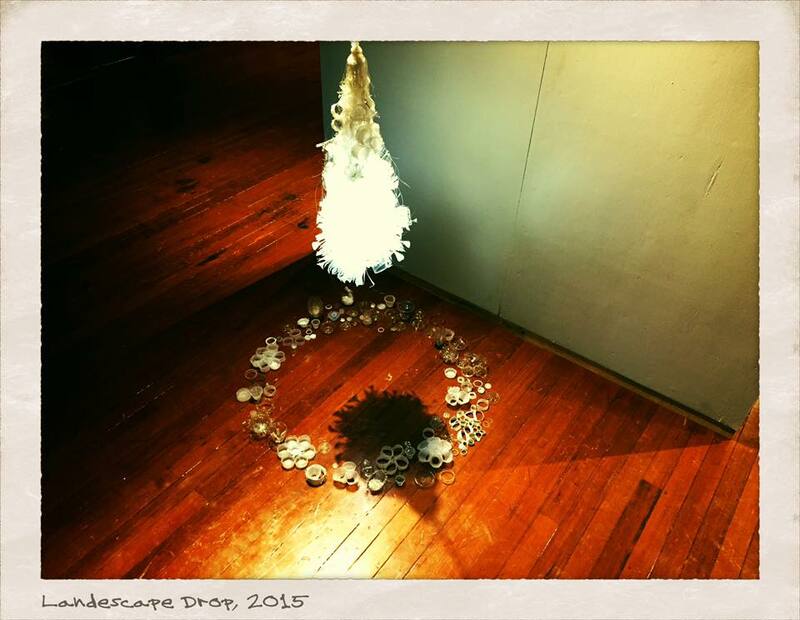 Rebecca’s installation is entitled “Landescape Drop”. 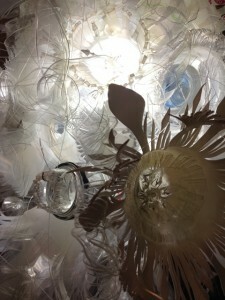 It is constructed out of discarded plastic bottles that are repurposed into an amazing chandelier-esque suspension that daintily dangles over a mini plastic assemblage arranged in a circle below the sculpture. It is lit from within with an energy efficient florescent light source and it reminds me of a beautiful jellyfish hovering below the ocean waves. Plankton make nutrients + oxygen from the power of the sun, from photosynthesis. Half of the world’s oxygen is produced by ocean phytoplankton (plant plankton). Plastics come from chemically processing oil, coal, natural gas + more (but are mostly made from oil). Marine creatures are downstream of our waste streams. As plastics break into smaller pieces, marine life mistake the plastic bits for plankton. Plastics are persistent. As they disintegrate, they cycle through us + our ecologies – never biodegrading – just breaking into smaller pieces. As plastics go through us, they disrupt our hormonal systems. Molecularly, plastics bits are endocrine disruptors, acting as keys within our cells, turning on + off bodily systems that evolved to function over millions of years. If you plan to attend the exhibit opening, do so in the next two weeks! If Vermont is just not on your path, check back here in a few days and I will post some more photos! Very, very cool! I really am inspired by her work! Plastics and our oceans are not a good mix! Who knows what type of damage they’ll do as they start descending into the depths and the very fragile creatures that live there!